If you are planning to build professional-quality muscle mass, you have to forget about using ordinary protein supplements. 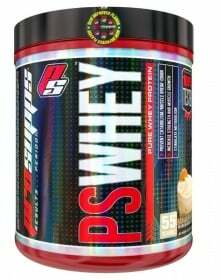 Prosupps presents the perfect professional-level whey protein formula that will satisfy your advanced protein demands... the only whey for you is PS Whey! These 2 protein sources are both rapidly digested by the body, instantly creating a surging river of amino acids flowing right into your hardworking muscles. This fast-digesting quality makes PS Whey an excellent protein shake to take early in the morning to start your day, or as a fast-acting post-workout shake that nourishes your famished muscles. PS Whey also features a high-performance Amino Acid Complex that contains L-Glycine and Taurine, plus the 3 BCAAs (Leucine, Isoleucine and Valine) which will reinforce your muscle growth, prevent muscle catabolism and improve your overall workout results so you can achieve your muscle-building targets much faster than before. PS Whey is low in carbs, sugar and fats, ensuring that each creamy serving is loaded with massive amounts of premium protein that your muscles need for maximum growth and recovery! For high-octane protein support, don't rely on regular protein shakes... choose professional quality protein that can only be delivered by Prosupps PS Whey! Have a question about PS Whey? What is it, what does it do, how and when to use or something else? Ask us. “PS Whey 924 g” is currently out of stock. Enter your details below and we will let you know when it's back in stock. Other Ingredients: Protein Matrix (whey protein concentrate, whey protein isolate), cocoa, natural and artificial flavors, sodium chloride, sucralose, guar gum, xanthan gum, sunflower oil, sodium caseinate, monoglycerides, diglycerides, maltodextrin, dipotassium phosphate, soy lecithin, sodium silico aluminate, tocopherols. For a great tasting, delicious shake combine 1 scoop with 180-360ml of cold water (depending on personal preference for desired thickness). Use 2-3 servings daily for maximum protein uptake. Always drink 360 a 480ml of additional water for each protein shake consumed. WARNINGS PS Whey : Seek advice from a doctor prior to use in case you are using any medicine and have any kind of medical problem. Do not take if pregnant or nursing. Discontinue use and call a health care professional immediately if you experience any adverse reaction to taking this product. Keep Out Of Reach Of Children and Pets. This product is only intended for use by healthy adults, 18 years of age or older.